Majority of those who bought this shoe preferred the lace-less technology and the superior fitting control of the Reebok InstaPump Fury OG. Many customers find this shoe ideal for daily wear projecting the retro athleisure style of the Fury shoes since the 1990s. Most sneaker fans are still amazed at the Pump technology providing custom fitting all these years. A good number of shoe reviewers find the Hexalite cushioning still responsive to their movements and needs. Tongue and heel pull tabs, according to some shoe wearers, provide speedy entry and exit out of the footwear. A few reviewers praised the unique design and silhouette of the Reebok InstaPump Fury OG that visually stand out among other sneakers. A large number of sneakerheads complimented the Reebok InstaPump Fury OG’s EVA cushioning as it keeps the feet comfortable. Some customers appreciate the good placement of ventilation with mesh underlays as it keeps air circulating inside the shoe ensuring breathability. A good number of loyalists of this shoe appreciate that Reebok revamped the shoe in its original design and colors. For an iconic and popular shoe, the OG version’s price of $160 for every pair is reasonable and a good value according to many reviewers. Some complained that the pump is no longer durable and gets easily broken after prolonged use. The Reebok InstaPump Fury OG runs a bit small that some customers choose a higher-sized shoe to fit them well. A few critics commented that the Hexalite cushioning is decent but doesn’t compare well in terms of performance with the modern cushioning technology of other popular brands. For an iconic shoe that has remained popular for more than 20 years, Reebok InstaPump Fury is one shoe that every serious sneaker collector must have. As one of Reebok’s most successful designs, the InstaPump Fury brings a lightweight shoe laden with superior cushioning, reliable shock absorption and a customized fit via a manual pump. If it is a comfortable and superior cushioning that you are after, the dependable InstaPump Fury is the classic shoe that can’t be unseen in the sneaker universe. 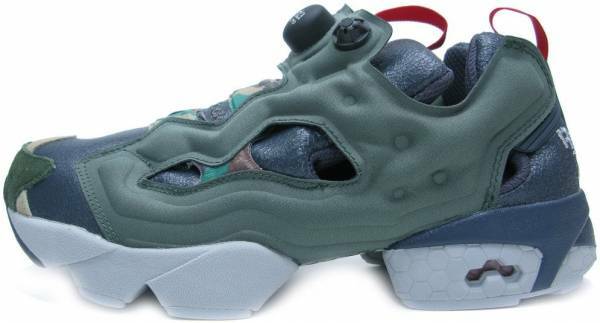 Coming out of the popular Pump line, sneaker fans have long been fascinated with the Reebok InstaPump Fury. The love for the shoe seemed to have stuck as the brand remains popular shoes even in 2017 or more than 25 years since it was released. Designed by veteran shoe designer Steven Smith in 1994, the man who was also behind the creation of the New Balance’s iconic 574, 996, 997 and 1500 models, the InstaPump Fury design is also as iconic and as popular as a sneaker can get. In fact, the InstaPump Fury’s futuristic design remains on display at the Design Museum in London. The Fury still commands presence in shoe stores worldwide capturing markets and cult following in Asia, Europe, and North America. The shoe was built on the same Pump technology being used in basketball popularized by Boston Celtics player Dee Brown during an NBA slamdunk competition. The futuristic-looking shoes contain air bladders that inflate and deflate for a customized snug fit. The InstaPump Fury also features a Graphlite carbon arch support, and a segmented Hexalite cushioning that reduces shoe weight significantly. The InstaPump Fury drew mixed reactions from sneaker fans early on after release but remained very popular in Asia particularly in Hong Kong where martial arts superstar Jackie Chan first wore the yellow colorway of the shoe. In succeeding releases of the Fury, the most noticeable is the 20th Anniversary release which featured the shoes in 33 collaborative colorways including BAPE in Japan, MILK Magazine in Hong Kong, Invincible in Taiwan and colorways dedicated to popular anime like Gundam and Ghost in the Shell. This year 2017, interest in the InstaPump Fury has never waned. It has crossed over from running to fashion and has been redone through collaborations with Concepts, Boris Bidjan Saberi, Vetements, End Clothing, Sandro, Bape, and most popularly in 2003 with Chanel. It seems the interest for the futuristic shoe is not yet over and still growing through the years. The Reebok InstaPump Fury seems to never get out of style since it was released in 1994. The shoe’s futuristic silhouette and lace-less design always stand out. The unique combination of colors, materials, and cuts results to what many sneaker fans dub as a shoe meant to make heads turn. Add this to the customized fitting coming from the pump that seems very cool to show off to friends when adjusting sizes by manually pumping air in and out of the shoe. The shoe also comes in interesting colors that blend well with any casual clothing. Designed for achieving that retro look, the InstaPump Fury is aimed for everyday wear highlighting the athleisure style and the heritage silhouette of the iconic sneaker of the 1990s. With the promise of customized fitting through the Pump technology, the Reebok InstaPump Fury OG runs true to size. Through the pump, an air bladder inside the shoe is inflated to adjust fitting while a deflate button is located near the shoe to loosen the fitting. While the OG version seems to be available only for men, other versions of the Instapump Fury are available for women’s sizes such as the InstaPump Fury Overbranded and InstaPump Fury Sublim. The InstaPump Fury is available in men’s sizes 7 to 13 and width at medium – D.
The iconic Reebok InstaPump Fury was a trailblazer when it comes to design and innovation. Foremost of its notable feature is the Pump Technology Full-Foot Chamber System that guarantees a customized fitting. The shoe also boasts of a GraphLite carbon fiber bridge that removes the midsole making the entire shoe lightweight. Another important component of the InstaPump Fury is the Hexalite technology that is well placed in the heel and visibly seen in a hexagon -shaped lug design that is meant for extraordinary comfort and reliable air cushioning. This cushioning system also softens impact while providing traction and stability via the hexagon-shaped lug pattern. Celebrities spotted wearing the InstaPump Fury include Swizz Beatz, Chad Johnson, Juelz Santana, Youngjun Koo, Fabolous, Future, Kendrick Lamar, Chris Brown, and Kylie Jenner. The futuristic-looking sneakers have a Hexalite Sole Unit detailing that prioritizes lightweight cushioning. Sneakers were rendered in an OG colorway of black, red and yellow reminiscent of the original 1990s kicks.